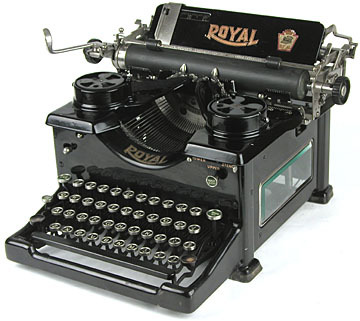 In 1914, the upright Royal 10 appeared. This was the classic model with beveled glass sides that would become one of the market leaders. Early No. 10s had two windows through which the machine's workings could be viewed, and later models had just one window. Like other Royal models, this one is stylish almost as a bonus -- Royals were all designed to be functional, reliable workhorses. In fact, the Royal Company even organized publicity stunts in which their No. 10 typewriters were dropped out of airplanes (inside crates) to show they could survive such a dramatic fall. Yet people continued to appreciate the appearance of the machine just as much as its reputation for strength.